The Great Cloth Diaper Change is a worldwide event that happens every year on Earth Day weekend. 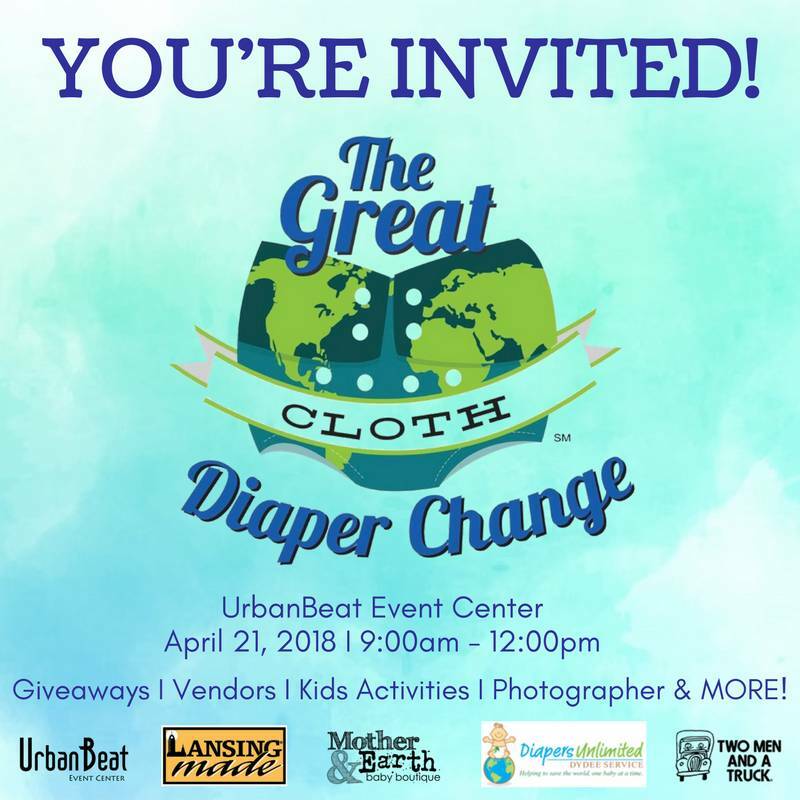 The Great Cloth Diaper Change (GCDC) is an annual event held Earth Day weekend. Mother & Earth Baby Boutique has (co-)/hosted this event for 6 years. Like last year, the event will take place across the street from the boutique at Urban Beat Event Center. The purpose of the GCDC is to raise awareness of the benefits of cloth diapering for people and the planet. At the GCDC, we will attempt to help break the world record for most babies changed into a cloth diaper. The event is open to the public, as we will have many local vendors and family activities. Some of the local vendors that you will find at the change include Action Baby Carriers, Goldfish Swim School Okemos, Where the Wild Things Bloom, and more. We will have a kid's planting activity, a photographer, and more fun. When you participate in the event you'll also have the opportunity to win one of many prizes, thanks to donations from businesses like Green Toys, Re-Play Recycled, Amber Monkey, Thirsties, and more. To participate in the world record breaking attempt, bring a 100% reusable cloth diaper with you to change your child into, it does not matter what they come in. If you do not have a cloth diaper, but would like to participate, just let us know and we can loan you a cloth diaper. We are thankful for our generous sponsors this year: Urban Beat, Lansing Made, DyDee Baby, and our charity partner Two Men and a Truck Lansing. Two Men and a Truck will be on site collecting new items for their Movers for Moms program. We encourage you to bring a new personal hygiene item or clothing for moms or children. If you have any questions about the event please contact us. We hope to see you there!